Weighing only 9 lbs., the APT Model 109 Rock Drill and Utility Drill is the lightest tool American Pneumatic makes. It is the ideal tool for drilling holes for anchor bolts as well as for small dowel hole drilling. The stop rotation feature easily converts the tool from a drilling machine to a percussion only tool. 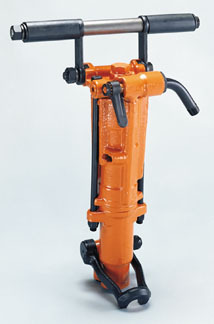 The APT Model 115 Rock Drill works as a drilling tool for drilling holes for anchor bolts and small dowel hole drilling. This versatile tool has a stop rotation feature that converts it from a drilling tool to a percussion tool. It is an ideal tool for light chipping in horizontal and overhead work. 5197 7⁄8" Hex x 3-¼"
The APT Model 137 Rock Drill is a versatile midsize rock drill used in general construction, utility work, and plant maintenance. It is designed for drilling through granite, hard faced rock, quarry drilling and for drilling secondary holes for blasting. It can also be used in conjunction with dowel hole drilling machines. The Model 137 is adaptable to wet drilling application by attaching the APT valve, wet tube and swivel assembly. 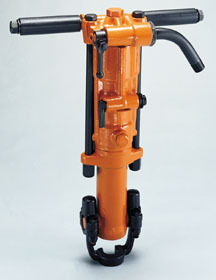 The APT Model 155 Rock Drill is a tough,60 lb classRock Drill. This tool can be used in general construction as well as inutility work and plant maintenance. It is designed for drilling through grantite, hard faced rock, quarry driling and drilling secondaryholes for blasting. This tool canalso be used with dowel hole drilling machines. 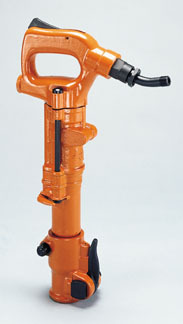 Adaptable to wet drilling applications by attaching the APT valve, wet tube and swivel assembly.